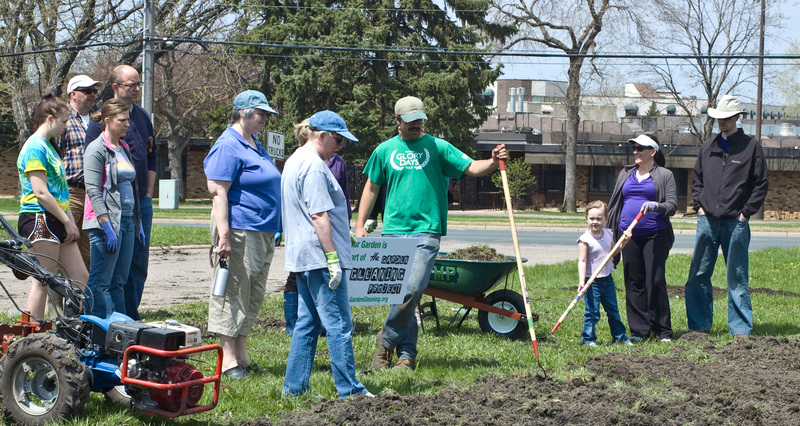 The Minnesota Project is partnering with the Emergency Foodshelf Network (EFN) to turn their front yard into a Micro Farm for growing fresh vegetables for the 100+ foodshelves they serve. All ready over 20 different vegetable varieties are in the ground with the help of many volunteers under the guidance of urban agriculture specialist Eric Larsen of Stone’s Throw Urban Farm. This project will serve as a pilot and the lessons learned and our best practices will be documented and shared with other companies, parks, churches, schools and groups that are interested in creating edible landscapes for growing food for those in need. In collaboration with Stone’s Throw Urban Farm, The Minnesota Project has designed a garden that will maximize the amount of produce grown in a relatively small space. A hoop house will be constructed later this summer in order to extend the growing season, allowing volunteers to harvest produce even after the first frost. Fruit trees will also be planted along the sides of their building to make use of all available space. “We are very excited to have the support of Hennepin County Public Health Department through the MN Department of Health’s Statewide Health Improvement Program (SHIP) for this demonstration project. This Micro Farm will show how intensive small scale farming techniques can be partnered with community volunteers and organizations to grow an abundance of healthy food on a small plot of land. Even on the front lawn of businesses in an industrial area. We are proving how community partnerships can impact food insecurity” said David Glenn, The Minnesota Project Executive Director. All the food grown in the garden has been planted, will be maintained and harvested with the help of volunteers. The fresh locally grown produce will then be distributed to food shelves throughout the greater Twin Cities Metro area at no cost. Many foodshelf clients express a desire to eat more produce, so the additional fresh groceries will be a welcome addition at the foodshelves. The Minnesota Project is recruiting volunteers throughout the growing season to help with the garden. If you would like to join that team, please contact EJ Gurley, the project coordinator at The Minnesota Project, 651-789-3325 or email: ejgurley@mnproject.org . Don’t Forget! It’s Give to the Max Day!